This widely acclaimed biography of Stalin and his entourage during the terrifying decades of his supreme power transforms our understanding of Stalin as Soviet dictator, Marxist leader, and Russian tsar. Based on groundbreaking research, Simon Sebag Montefiore reveals the fear and betrayal, privilege and debauchery, family life and murderous cruelty of this secret world. Written with bracing narrative verve, this feat of scholarly research has become a classic of modern history writing. Showing how Stalin's triumphs and crimes were the product of his fanatical Marxism and his gifted but flawed character, this is an intimate portrait of a man as complicated and human as he was brutal and chilling. SIMON SEBAG MONTEFIORE is a historian of Russia and the Middle East. Catherine the Great and Potemkin was short-listed for the Samuel Johnson Prize. 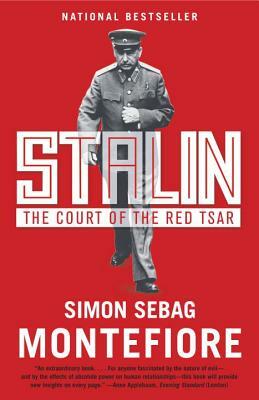 Stalin: The Court of the Red Tsar won the History Book of the Year Prize at the British Book Awards. Young Stalin won the Los Angeles Times Book Prize for Biography, the Costa Biography Award, and le Grande Prix de la biographie politique. Jerusalem: The Biography was a worldwide best seller. Montefiore’s books are published in more than forty languages. He is the author of the novels Sashenka and One Night in Winter, which won the Paddy Power Political Fiction Book of the Year Award in 2014. A Fellow of the Royal Society of Literature, Montefiore graduated from Cambridge University, where he received his PhD. He lives in London.